Sydney Opera House presents 3: The Composers. ARVO PART: A Sacred Journey in the Concert Hall. Last year in early May, I attended The Composers program, STEVE REICH in Residence. A Celebration, curated by Yarmila Alfonzetti for the Sydney Opera House in the Concert Hall and had a very exciting and bliss filled experience. 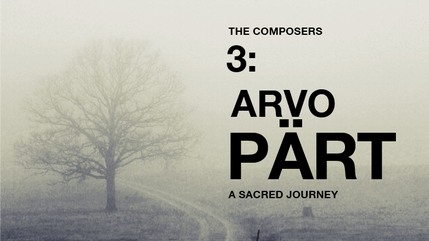 So, The Composers 3: ARVO PART, A Sacred Journey, raised some high expectations, as well, for a similar time. And, although the composer, unlike last year when Mr Reich was present and in charge, Mr Part was instead, represented by Tonu Kaljuste and The Estonian Philharmonic Chamber Choir. Avo Part is an Estonian composer, born in 1935, and is a composer of sounds, music of minimalism. The spaces between the notes are as important, it seems to me, as the music notes themselves. He uses a pared-down set of musical elements to yield a kind of ethereal, fuller overall effect of delicate but powerful sounds. Part's musical apprenticeship was subject to the cultural prescriptions of the Soviet bloc, and its preferred aesthetic of 'socialist realism'. His music of the 1960's uniformly demonstrated a fascination with predetermined schemes and musical processes: a fascination noticed (and shared by Steve Reich), among others. And it was after leaving the USSR in 1980, that the Russian Orthodoxy faith, to which he had converted began to be expressed through the sacred music he began to produce, most pronouncedly. In this concert, the sacred music featured: MAGNIFICAT (1989); 7 MAGNIFICAT ANTIPHONS (1991); CANTUS IN MEMORY OF BENJAMIN BRITTEN (1989) and ADAM'S LAMENT (2009). The Estonian Chamber Choir was led with great concentration, beauty, and, I, especially, was moved by the SALVE REGINA (2011), accompanied by musicians from the Sydney Symphony Orchestra. Well known works such as SPIEGEL IM SPIEGEL (1978); TABULA RASA (1977) and FRATRES (1982) were also given. This concert left one in a place nearer 'heaven'. A place where contemplation of the spiritual mysteries of our creation could be contemplated. A special night. It was a let down to come back to this earth and the bus ride home. I had also attended the concert, the night before, given by the Sydney Youth Orchestra in the Studio at the Sydney Opera House and appreciated the compositional level of difficulty that the music of Arvo Part makes. As with last year, the benefits to these young musicians working on such music of such demand, revealed what a remarkable experience for their developmental journeys it must be to have this opportunity. P.S. As a note for the producers, I do not believe the projected images, and especially the dropping of the artificial snow flakes and gently fanned clothing of the violinist during the Spiegel im Spiegel were a necessary element in the presentation of the music. Rather a ham-fisted reality that, visually, was trite, even kitch, beside the real beauty of the musicianship on stage.